(1881-1973), Spanish painter and sculptor, generally considered the greatest artist of the 20th century. He was unique as an inventor of forms, as an innovator of styles and techniques, as a master of various media, and as one of the most prolific artists in history. He created more than 20,000 works and paintings. Inspired by the volumetric treatment of form by the French postimpressionist artist Paul Cezanne, Picasso and the French artist Georges Braque painted landscapes in 1908 in a style later described by a critic as being made of �little cubes,� thus leading to the term cubism. Some of their paintings are so similar that it is difficult to tell them apart. Working together between 1908 and 1911, they were concerned with breaking down and analyzing form, and together they developed the first phase of cubism, known as analytic cubism. Monochromatic color schemes were favored in their depictions of radically fragmented motifs, whose several sides were shown simultaneously. Picasso's favorite subjects were musical instruments, still-life objects, and his friends; one famous portrait is Daniel Henry Kahnweiler (1910, Art Institute of Chicago). In 1912, pasting paper and a piece of oilcloth to the canvas and combining these with painted areas, Picasso created his first collage, Still Life with Chair Caning (Mus嶪 Picasso, Paris). This technique marked a transition to synthetic cubism. This second phase of cubism is more decorative, and color plays a major role, although shapes remain fragmented and flat. 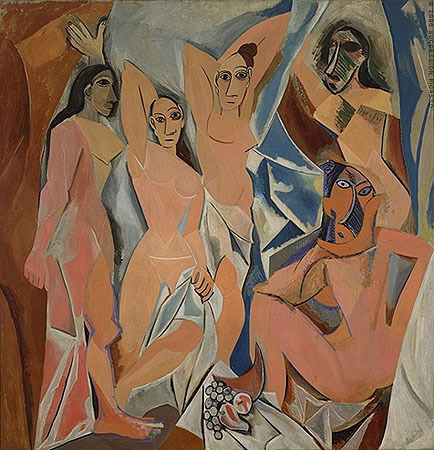 Picasso was to practice synthetic cubism throughout his career, but by no means exclusively. Two works of 1915 demonstrate his simultaneous work in different styles: Harlequin (Museum of Modern Art) is a synthetic cubist painting, whereas a drawing of his dealer, Vollard, now in the Metropolitan Museum, is executed in his Ingresque style, so called because of its draftsmanship, emulating that of the 19th-century French neoclassical artist Jean August Dominique Ingres.